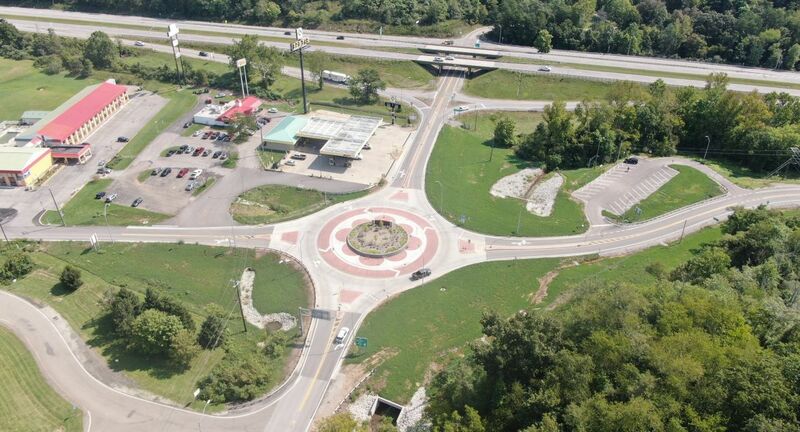 B&N designed a roundabout for the West Virginia Division of Highways (WVDOH) to help reduce congestion and improve safety. Located near the first exit off Interstate 77 after crossing from Ohio into West Virginia, the roundabout will serve as a highly visible and aesthetically pleasing approach to the Williamstown Welcome Center. B&N’s scope of services included roadway design, water line and sanitary sewer relocation, lighting and landscape architecture plans. B&N also designed a Park and Ride lot nearby to serve carpoolers who currently park along the roadway. The new, $4.5 million single-lane roundabout will replace the T-intersection at West Virginia Routes 14 and 31. Currently the intersection is controlled by stop signs and there are frequent backups caused by interstate traffic, visitors to the West Virginia Welcome Center and local traffic traveling to two nearby schools. The roundabout also will include a truck berm to accommodate tractor trailers traveling from a neighboring truck driving school and manufacturing sites. While evaluating intersection improvement options, a signalized intersection was ruled out because traffic would still back up onto the interstate during peak periods. Local officials and community members requested a roundabout to help relieve traffic woes at this location. Construction of the Williamstown Roundabout is expected to start in late 2018 and take about 18 months to complete.